Peeping between trees in annoying rain. For all that we are trying to celebrate spring, for all that blogs are full of hellebores and hopes of blossom, I feel we are straining at the leash. We aren't there yet. Daffodils may be nearly over but they flowered in late winter rather than in spring. There may be primroses on the hedgerow banks but they are like little beacons of what's to come. Birds may be noisier than they have been over winter but they aren't in full voice yet. Not here they aren't. Indeed, the mornings seem to be getting darker. Perhaps we will be skipping summer this year. The trees won't properly open their leaves or bother with autumn. Plants, trees and creatures may have been knocked back by unusually strong winds and wet weather. I don't think it's the same all over the country. 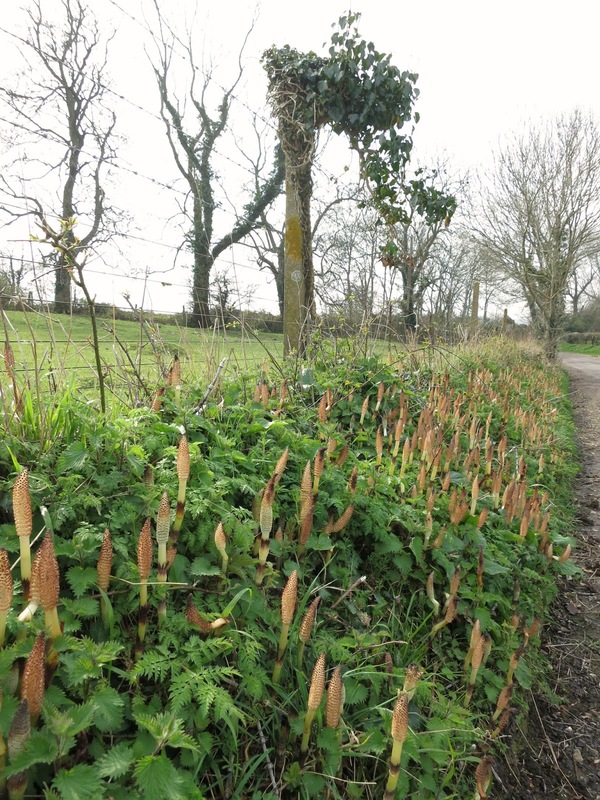 Even only a few miles away from the sea I came across a bank of horsetails more advanced than I've ever found them here. And it's bound to be subjective too. Even if everyone else smells spring in the air - I don't. To me, it's still late winter. The light is almost consistently dull. Rain un-refreshing. The ground cold. Are you too ready with your tree-following posts? I'm hoping the link box will come up of its own accord at 7 in the morning UK time. Scheduling can sometimes go wrong so, if it doesn't appear straight away, don't worry. I'll be hot on its heels to put it in manually. 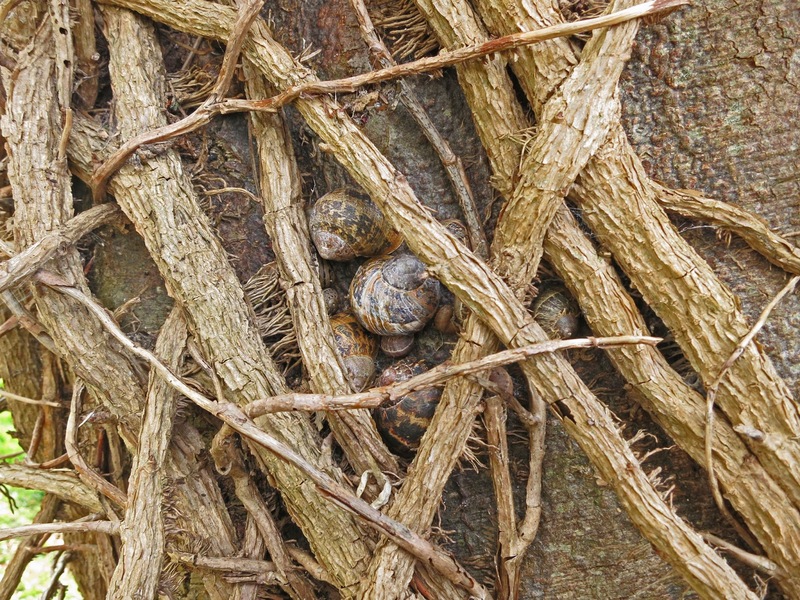 Snails in this tree, partially protected by thick ivy stems, still seem to think it's winter. 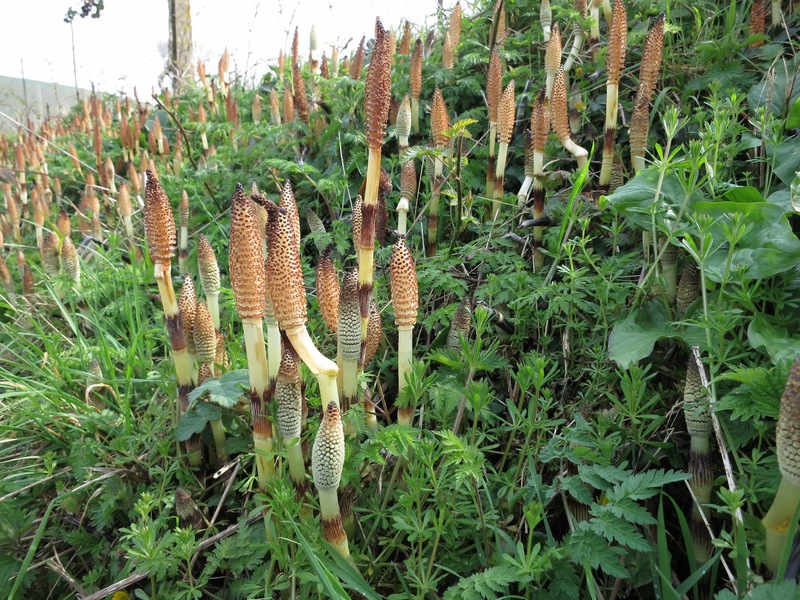 Posts about Horsetails closer to the sea. You can tell by the dates they grow later here. 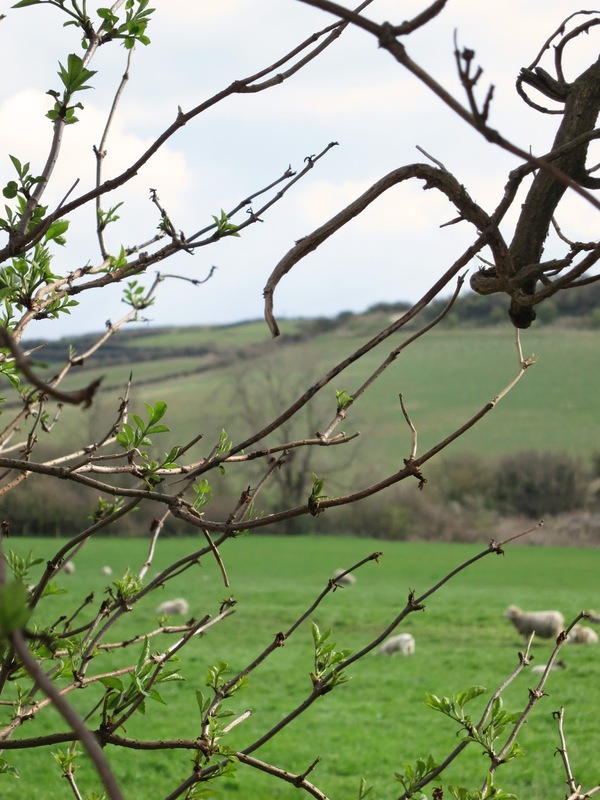 It's not too late to join us in following the progress of individual trees through the year - garden trees, park trees, hedgerow trees, wild trees. That "street" view could have been taken in the older part of the village I was born in! Different county, but very different feel. I suppose the "late" spring is just caused by the soil being so cold and wet - once it warms up, I imagine there will be an explosion of life. Hi, Jack. I imagine you are, at least to a degree, used to this time of year being cold. Is that right. Here, where I live, we are usually ahead of much of the rest of the country. It has been so warm here - heating went off on 1st April and could have been switched off earlier really. Even today, quite overcast and breezy, it didn't feel cold. Candles on the horse chestnut opposite Mile End station are standing up and getting ready to bloom. Hi, Stewart. 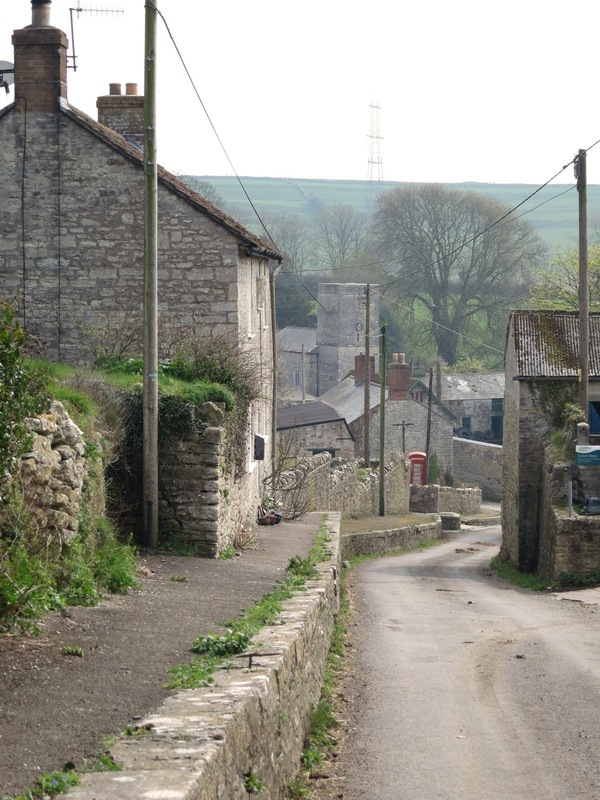 I feel this little village has more of a northern feel to it than fits with Dorset - something to do with the colour of the stone. (Not that it's even big enough to be called a village, really.) I expect you are right - that an explosion of life will come before long. Things are muddled though. I heard on the radio the other day that there may be a shortage of dragon flies in England this year. There has been so much flooding, the larvae will have been washed into the fields and towns and left stranded when the water receded. Hello. Our local weather forecast says there will be sunshine on Tuesday. And that's it. Rain before, Rain after. Was watching it slant sideways across fields earlier today. I think it's got muddled with autumn. Hello Joanne. 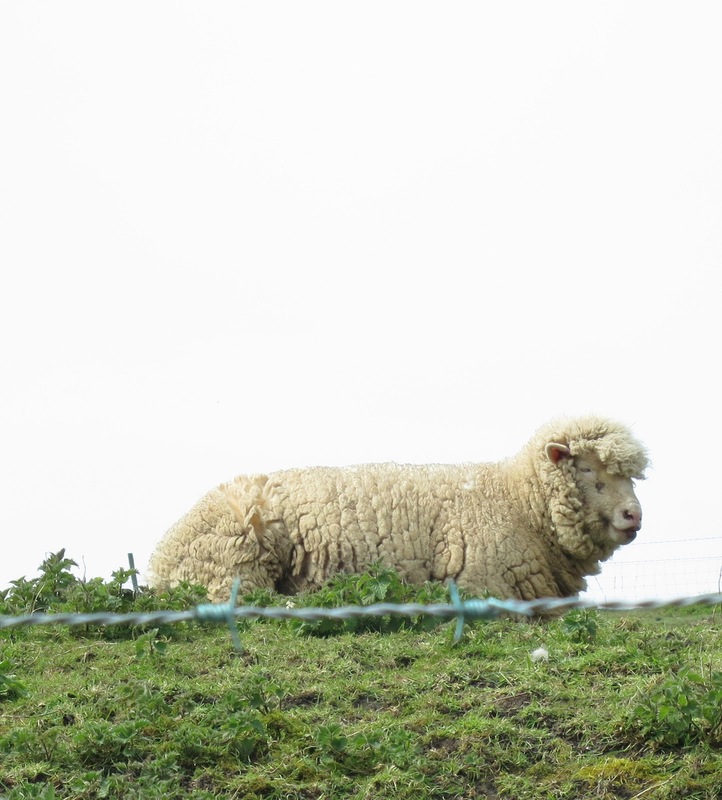 I'm glad you enjoyed our Dorset walk. Those horsetails are magnificent! I've only ever seen the green foliage in gardens (as an invasive problem) but those fertile stems you show look "alien" in the extra-terrestrial sense! Lovely post!! The horsrtails are amazing! I would love to walk through that beautiful village!! Someday, I hope to visit the English countryside!